ICCNC: Last Friday about 30 people assembled In Islamic Cultural Center of Northern California To support the Muslim community. came out of a suggestion by Shoulder-to-Shoulder, an interfaith organization dedicated to ending anti-Muslim sentiment. The crowd came to show friendship and solidarity, especially in light of the recent executive order by President Donald Trump banning travel from seven Muslim-majority countries. “It gives me the opportunity to learn,” said Karen Paull, who organized the trip for Jewish Gateways, a Berkeley-based nonprofit that connects Jews, much unaffiliated, through study and worship opportunities. For Rabbi Bridget Wynne, executive director of Jewish Gateways, the visit was a concrete manifestation of the “loves the stranger” teaching in the Torah. “This is a way to continue the work of connecting to people different from us and seeing them as people,” she said. In the same spirit, the Muslim men and women who come regularly to Friday prayers were gracious hosts. The center aims to celebrate Islam through art, education, and culture. Hashim Ali, a U.C. Berkeley Ph.D. candidate who leads services twice a month, touched on the commonalities among Judaism, Islam, and Christianity during the before-prayer sermon known as a khutba. 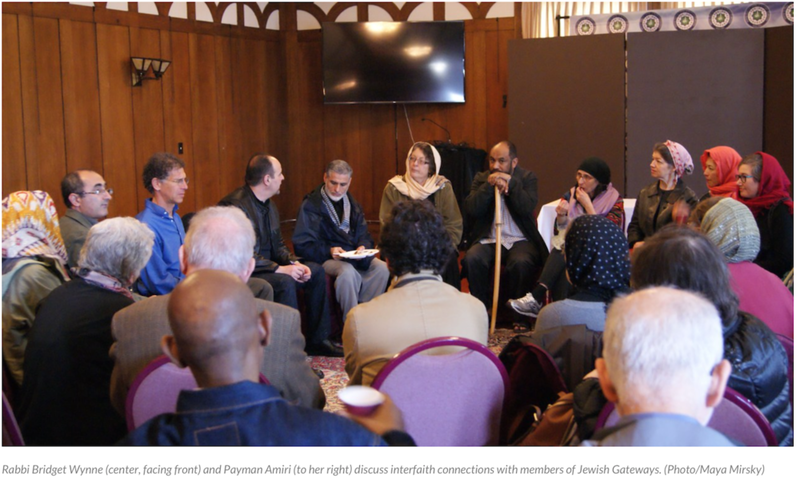 It may have been the first time some of the Jewish Gateway participants were inside a Muslim house of worship, but for many, it was only a first step. “Action is a great antidote to being disheartened,” Wynne said.